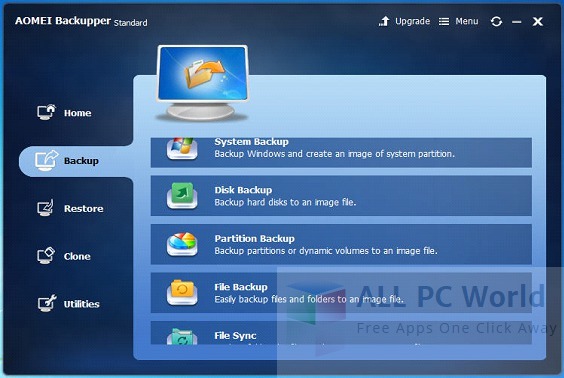 AOMEI Backupper Standard 3.5 is all-in-one backup and recovery software which is easiest and faster for users. This free download is a standalone installation setup for Windows 32bit and 64bit. Suffer a lot from data loss? Or worry about this will happen to you in the future? Then, why not backup your system, disks and files in advance, and once accidents happen, restore them all back immediately. AOMEI free backup software provides basic and advanced features to ensure the safety of your system and data. AOMEI Backupper Standard is also free system, partition and hard drive cloning software. It enables you to migrate system drive, transfer data, upgrade disk, or replace old small hard drive with new large one. Besides, there are many other useful utilities included in AOMEI Backupper Standard Edition, such as create bootable rescue media, PXE Boot tool etc. With these tools, you can manage your backups even better. System, hard disk, partition, file, and folder backup and restore. Supports full, incremental, differential, and automatic backups. Disk and partition clone for upgrading HDD or transferring data. Create WinPE or Linux boot recovery environment in case of system fails. Compress, comment, split, encrypt, explore, and check backup images. Migrate operating system (OS) and all applications in system drive to the faster SSD. Supported Storage Devices：Local disks, External hard disks, Solid state drives, USB flash drives, Network-attached storage (NAS), Hardware RAID, Dynamic Disk and Virtual machine system etc. Supported Disk Types：MBR disk, GPT disk and UEFI Boot. Click on the below link to download the standalone installer of AOMEI Backupper Standard 3.5 for Windows x32 and x64 architecture. This is complete offline setup which is compatible with all the latest operating systems.